Water Features are the hottest trend in landscaping today. High maintenance lawns, with Washington’s water and moss problems, can be transformed into beautiful low maintenance water features. Whether you have a natural slope or a yard with a flat terrain, we can create one of these natural looking and environmentally friendly customized features. Come and join our list of many satisfied clients who readily profess that adding a water feature to their landscape was the best investment they have ever made. We customize every waterfall to achieve aesthetic proportion to the slope and size of your property. Designs vary from multiple-step waterfalls to a meandering stream. To achieve continuity in the overall design, we encourage adjacent rock walls to enhance a more natural look. Our designs offer different focal points which lends itself nicely for possible decks, patios, or gazebos. Trees, shrubs, and groundcovers will tie it all together for the ultimate in peace and tranquility. With advanced filtration for a naturally-balanced ecosystem, our Koi Ponds provide a healthy home for these beautiful fish. 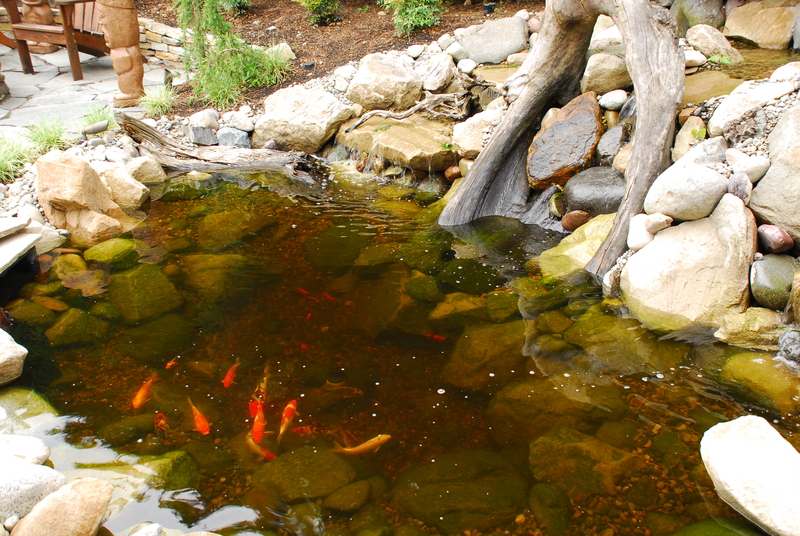 Typically, Koi Ponds are dug deeper and often require special maintenance. All features can be implemented into our systems. We have customers with Koi that are valued in the hundreds of dollars and beyond as well as more moderately priced domestics. Whatever your choice, colorful fish dancing playfully in your pond, will bring you hours of pleasure. When space is limited, installing a smaller water garden is the obvious choice. Watch your fish maneuver amongst your Water Lilies and Hyacinths for the ultimate in tranquility. All of our ponds are installed with 45 mil. EPDM rubber liner. This material gives us the strength along with the flexibility to design your feature to your needs. With plants in and around your pond, this will encourage birds, butterflies, and other wildlife to your backyard oasis. When you desire a more formal look or if space is limited, columnar features fit the bill. We have used Dzingle’s Landscaping for the last 20 years at two different residences for landscaping and maintenance services. This has included retaining walls, lawn replacement, sprinkler systems, ponds, and plantings. They have been very responsive and professional in their quality work. We recommend them to anyone.